A EU official is to visit Damascus Thursday in an effort to improve ties with Syria, which has allied itself with Iran, Hizbullah and Hamas. A European Union official is to visit Damascus Thursday in an effort to improve ties with Syria, which has allied itself with Iran, Hizbullah and Hamas. 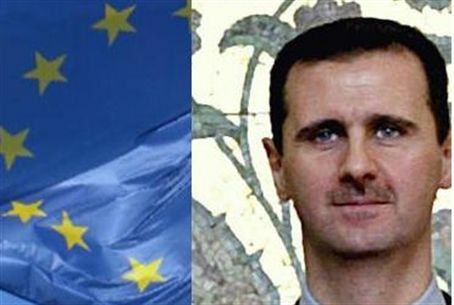 EU Commissioner for Enlargement Stefan Fule wants to activate the EU-Syrian Partnership agreement that was signed in 2004 following years of negotiations. The agreement was put on ice after the assassination of Lebanon’s former anti-Syrian Prime Minister, Rafik Hariri, in a bloody car bomb massacre in Beirut the following year. Last year, the EU said it was prepared to sign a Syrian-European Partnership Agreement, and the ceremony was planned for Luxembourg on Tuesday. However, Damascus has asked to postpone the ceremony, explaining that it wants more time to consider the agreement’s impact on its economy. The United States has labeled Syria a country that supports terror, but U.S. President Barack Obama has tried to “engage” Syrian President Bashar Assad in the “diplomatic process” for regional peace in the Middle East. Congress has balked at approving his request to return Washington’s ambassador to Damascus. The former envoy was recalled after the murder of Hariri, which has been widely pinned on Syria and the Hizbullah terrorist organization. Damascus also is the home of Hamas, which officially does not have ties with the EU, but which has softened its stand in recent months. A senior official of the United Nations Refugee and Works Agency (UNRWA), which is prominent in Hamas-controlled Gaza, said last week that European officials are in contact with Hamas. “I think it’s fair to say that all governments, whether they admit it or not, have had discrete contact with Hamas,” Andrew Whitley, outgoing director of the UNRWA’s New York office, said last week. One field in which Syria is engaging European countries is solar and wind energy in the country’s desert area. German Desertec Company of Desert Tech and Cham Holding Company stated in a press conference that the idea of "generating electricity from the solar energy in the Syrian Desert is under discussion,” the Syrian news agency SANA reported.